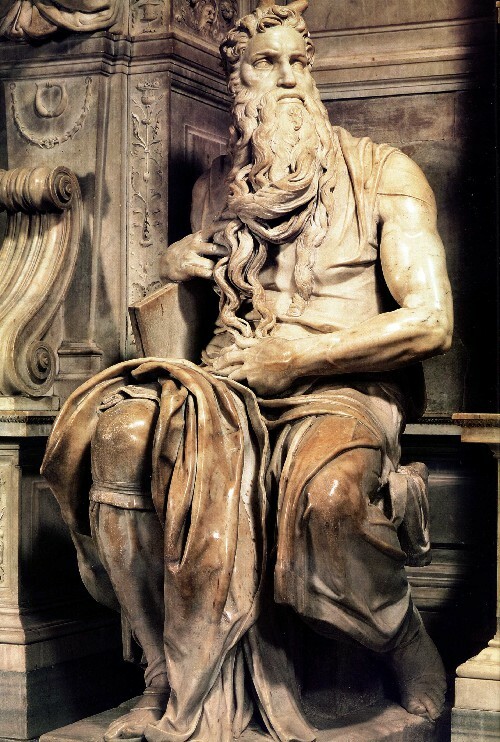 Michelangelo Buonarroti is, without a doubt the most revered sculptor of the Renaissance period and, despite his fresco work in The Sistine Chapel, he always considered himself to be a sculptor rather than a painter. He was raised in Florence but had lived with a stonecutter and his wife during his mother's long illness, and also for some time after her death. 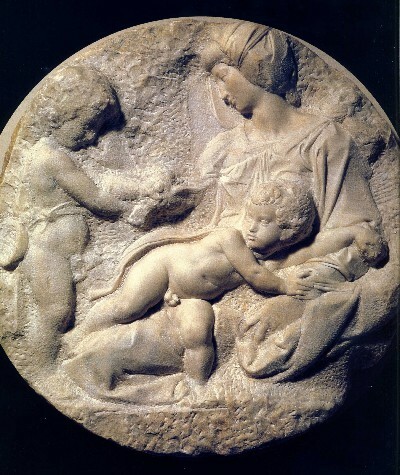 This early introduction to the stonecutter's trade fed Michelangelo's interest in sculpture and he studied at the school of Lorenzo de' Medici under the guidance of Bertoldo di Giovanni. 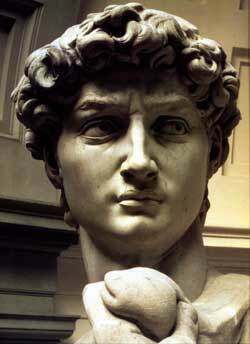 Depictions of Michelangelo are always marked by his crooked nose. 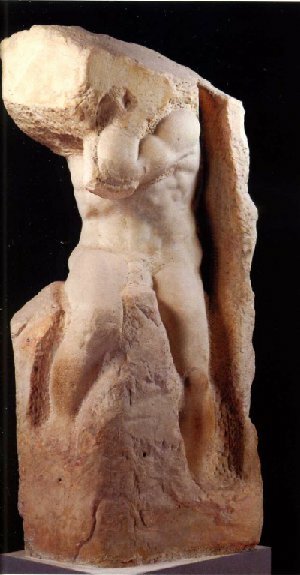 Even so, Michelangelo’s genius was not dulled by this violent encounter, he produced a copy of an ancient marble sculpture, a Faun. 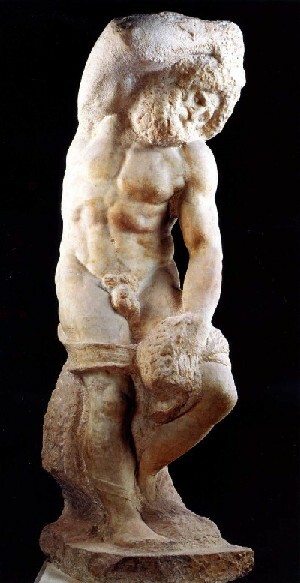 This depiction of a half man, half goat so admired by Lorenzo is sadly lost but it marked the beginning of the artist’s long and distinguished career as a sculptor. Two of his first sculptures are 'The Madonna of the Stairs', and 'The Battle of the Centaurs'. 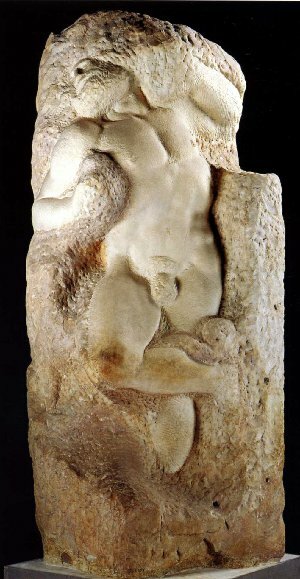 Cupid, boy-God of Love and Bacchus, The God of Wine. Also known as the Manhattan Cupid, due to its location, very little is known about this early work by Michelangelo. It Is thought to have been part of a collection of statues in the Villa Borghese Gardens in Rome. 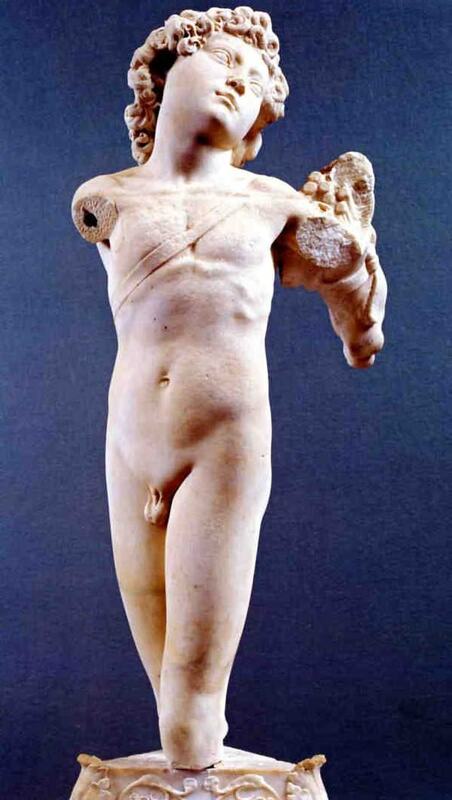 This badly damaged work originally had arms and legs which have broken off and are now sadly lost. Works in the Cathedral of San Domenico, Bologna. 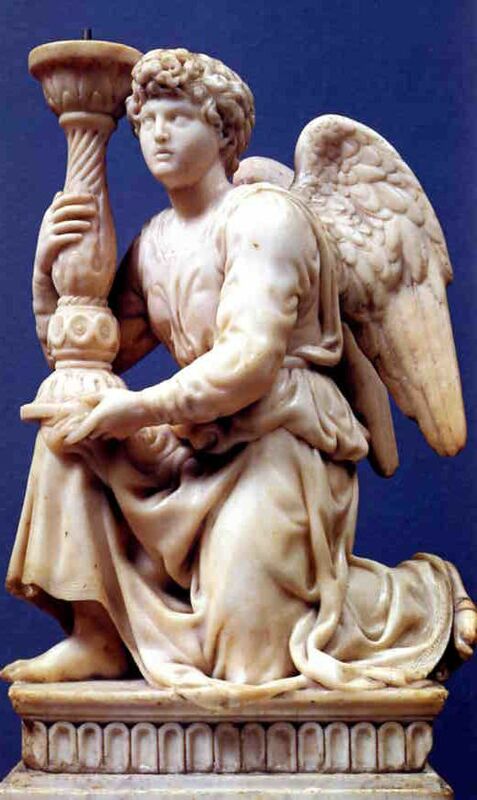 The Kneeling Angel was made as a companion piece for an earlier marble Angel by Niccolo d' Arca. 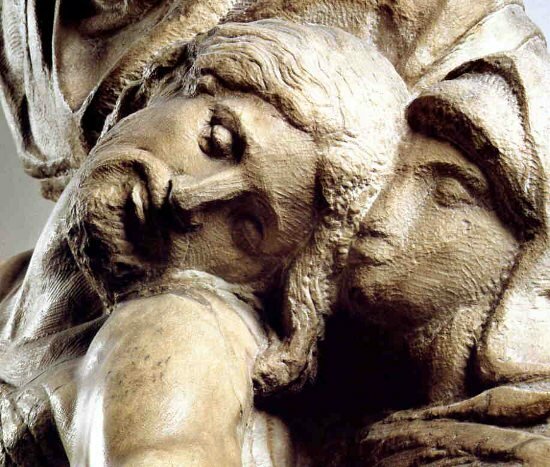 It is placed on the lower level of the tomb of St Dominic in the cathedral of San Domenico, Bologna. Kneeling on the left knee the Angel supports a beautifully carved candle holder on the right knee. The folds of the clothing expertly outline the body shape, a tribute to Michelangelo's undoubted skill as a master sculptor. Proculus is the patron saint of the Italian city of Bologna. 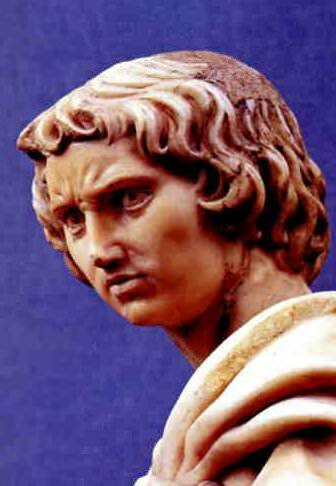 He was a Roman military leader and a Christian. Proculus was eventually martyred for his beliefs. 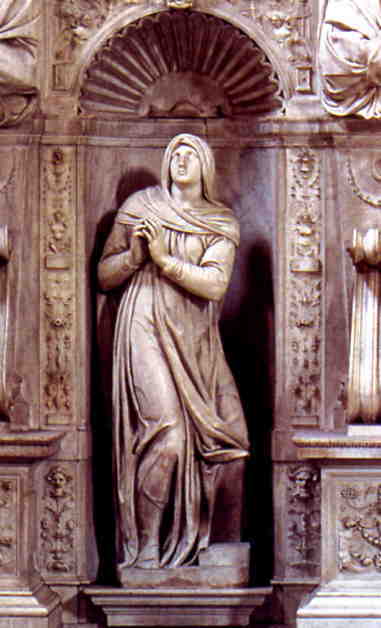 The marble statue is situated in the cathedral of San Domenico, Bologna on the tomb of St Dominic. Proculus once held a metal lance in his clenched right hand, sadly the lance is now lost. What a contrast to the Bacchus, the god with the all too human defects! 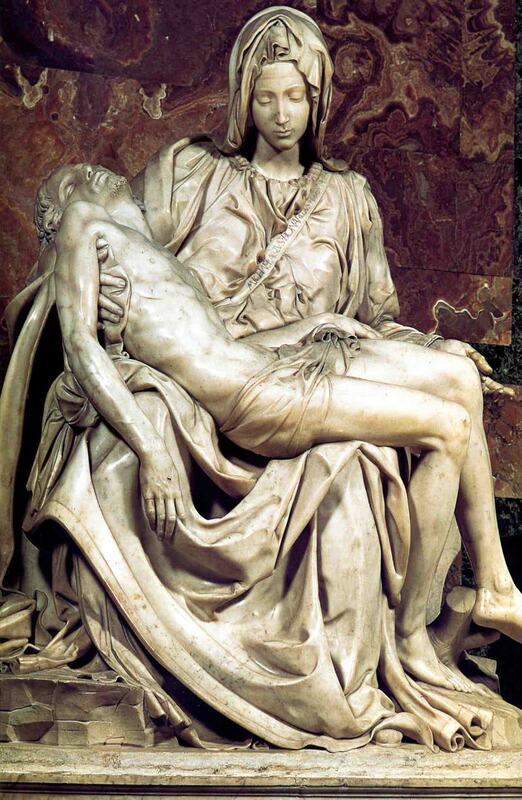 The Rome Pieta is an emotionally charged incarnation of a mother cradling her lifeless son. It is an almost universally loved portrayal of the Virgin and Christ. 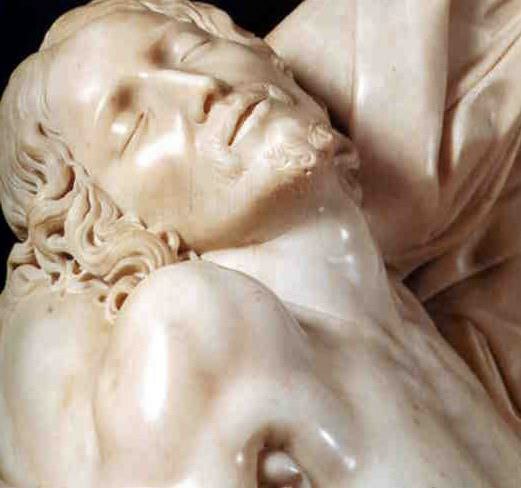 Carved from a single piece of marble this highly polished masterpiece has captured the sadness of Christ's mother as she gazes at the tortured body of her son. 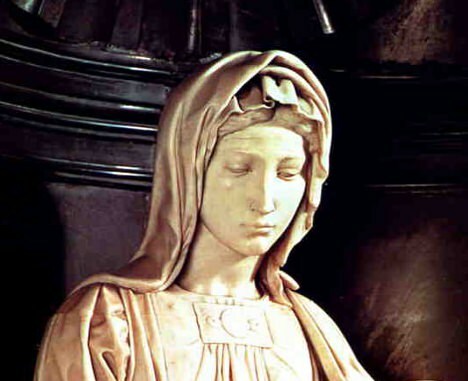 The sash worn diagonally across the Virgin is carved with the Latin words, "Michelangelus Buonarrotus Florentinus Faciebat" meaning "Michelangelo Buonarroti, Florentine, made this". The artist clearly intended to make sure that the piece was recognised as his work.
" 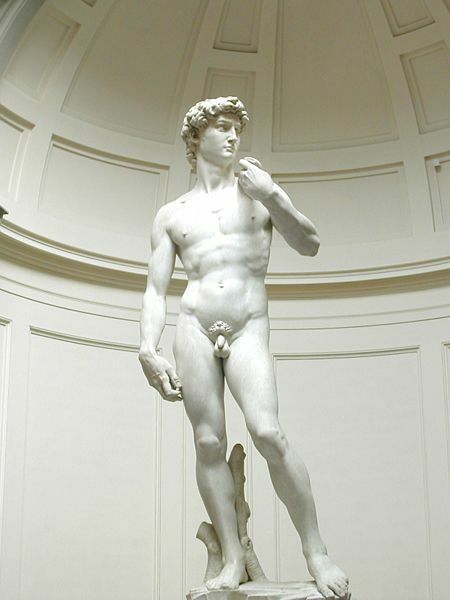 Without any doubt, this figure has put in the shade every other statue, ancient or modern, Greek or Roman... To be sure, anyone who has seen Michelangelo's David has no need to see anything else by any other sculptor, living or dead." 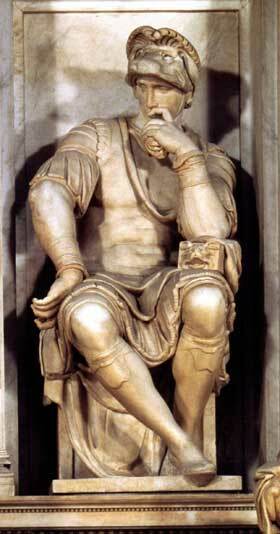 Do you get the impression that Vasari was quite taken with this statue? 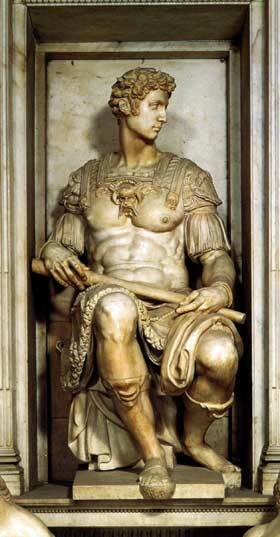 Note:-The statue on the Piazza della Signoria is a copy. Yes, I know it's probably the most recognised statue in the world and it's sometimes overlooked because the image is so familiar; but try to look at this work with fresh eyes and I think you will agree; it's just perfect! Named because it was commissioned by a group of merchants from that city. 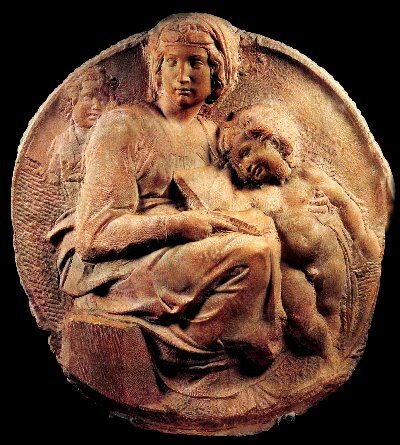 This is one of the artists lesser known works and was in fact described as being made of bronze by Michelangelo's biographer, Ascanio Condivi. 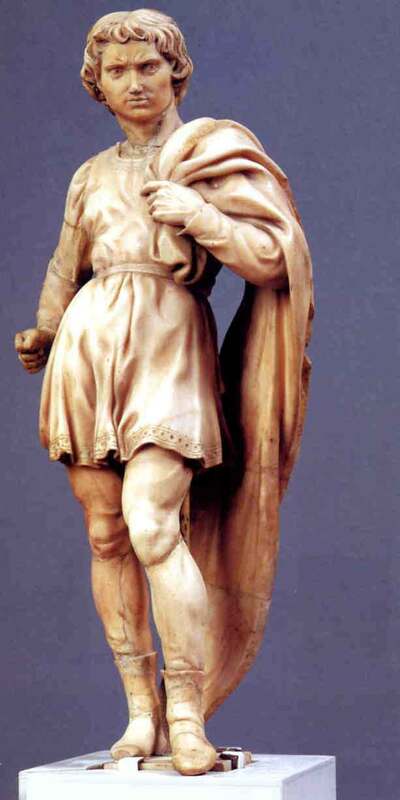 Commissioned by two Flemish merchants, Jean and Alexander Mouscron, the statue was dispatched to Bruges in 1506. It was intended for the merchant's family chapel in the church of Notre-Dame, Bruges. The Tomb of Pope Julius II. 1505-1545. 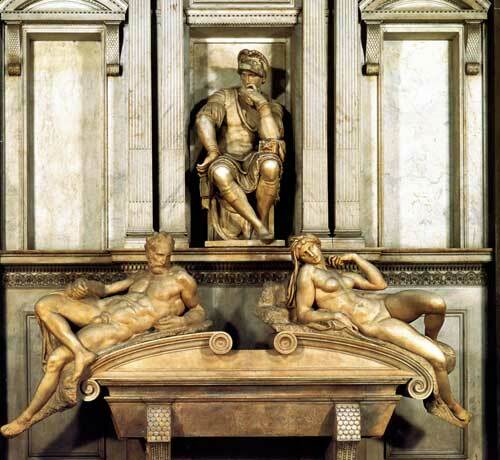 Michelangelo designed at least six different styles for this monument. The artist was given the commission by Julius with the promise of a huge payment of 10,000 ducats, an astronomical amount of money at the time. 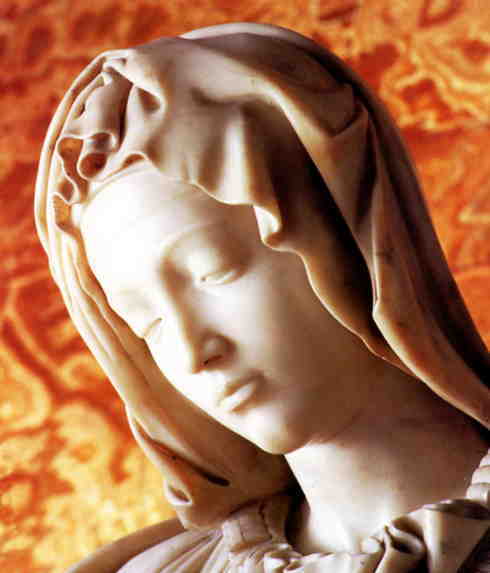 The scale of the project was reduced over the forty year period from conception to completion, however, the tomb contains some magnificent statues, and remains as a fine example of Renaissance art. Only the three figures at the bottom of the tomb (Rachel, Moses and Leah) are by Michelangelo, two figures of slaves intended for the tomb are now in the Louvre Museum in Paris. 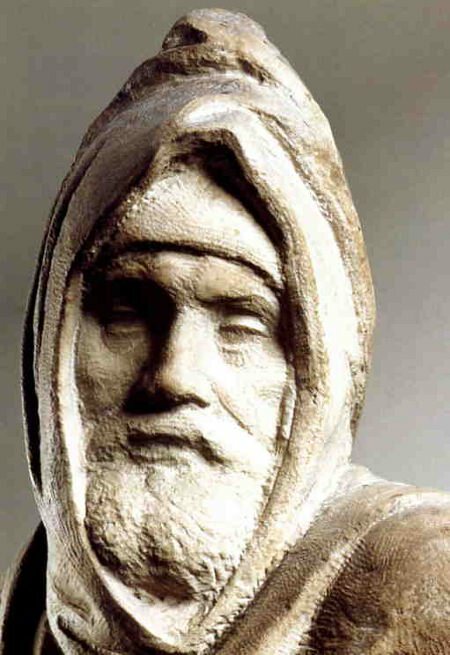 Intended for Pope Julius II funeral monument this magnificent work was designed to be the central figure of the mausoleum. 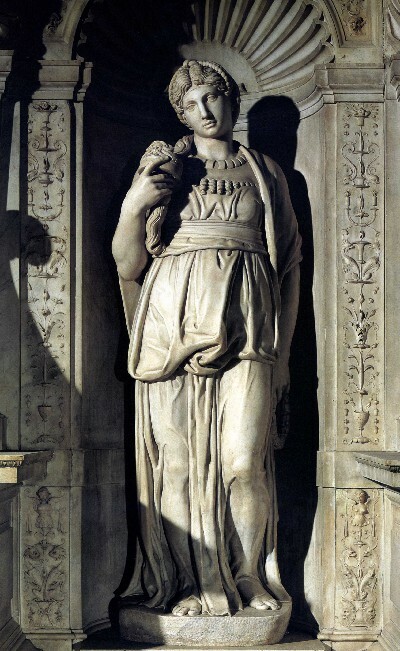 Both works were created between 1513-1520 for the base of the tomb of Pope Julius II. The statues can now be seen in the Louvre Paris. The figures proved to be too large for their intended locations in the niches of the tomb, they were replaced by the statues of Rachel and Leah. 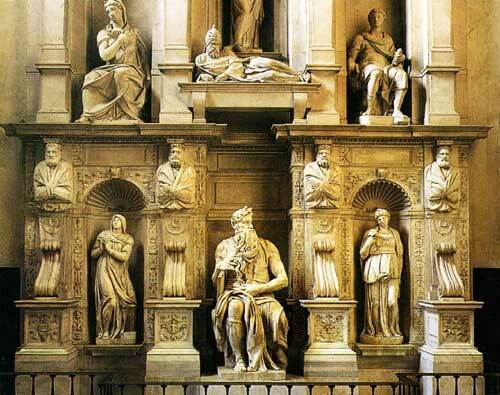 These four unfinished oversized statues were planned for the monument of Julius II. 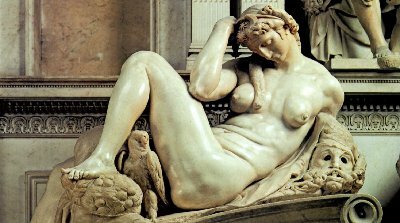 Part of the contract of 1516 specifying 22 sculptures they now reside in the Galleria dell' Accademia in Florence. They are, from left to right, Awakening Slave, Atlas Slave, Bearded Slave and Young Slave. 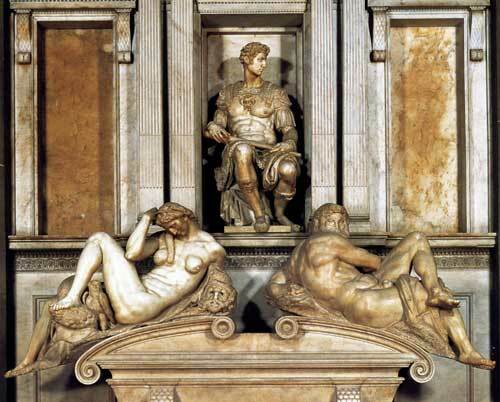 This monumental work was a combination of Michelangelo's skills in architecture and sculpture. It had long been an ambition of the artist to utilise these skills within the same artistic framework and his work in the Medici Chapel realised that ambition. This is of Lorenzo, Duke of Urbino, and not Lorenzo the Magnificent who was the most important member of the Medici family. Giuliano de 'Medici, Duke of Nemours. 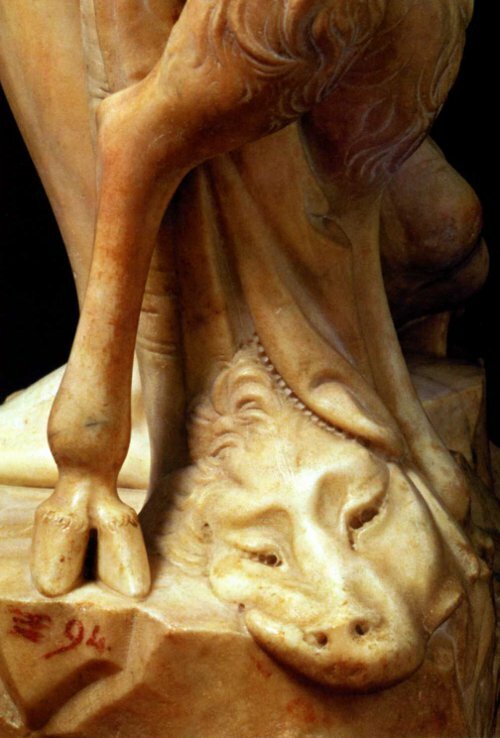 Detail of the female Night and Tragic Mask, beneath the body of Night suggesting that sleep imitates death. 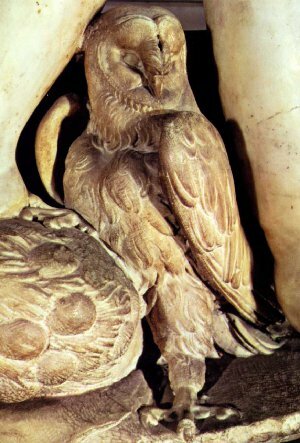 Owl, below the left leg of Night, is symbolic of the hours of darkness. 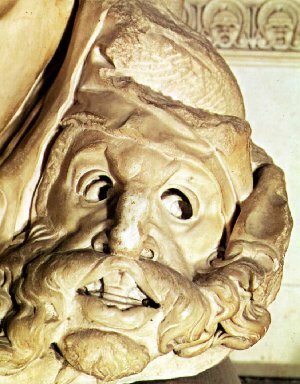 Detail, the head of Christ. 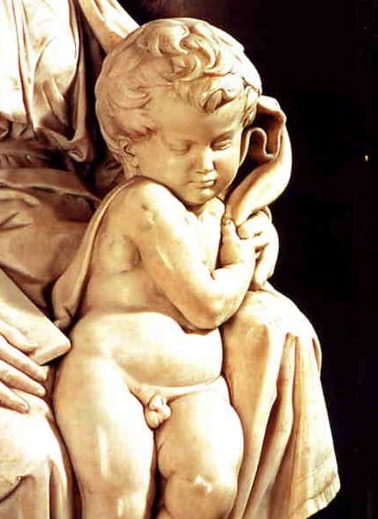 Michelangelo intended this to be his own funeral marker, it is one of his most elaborate pieces. 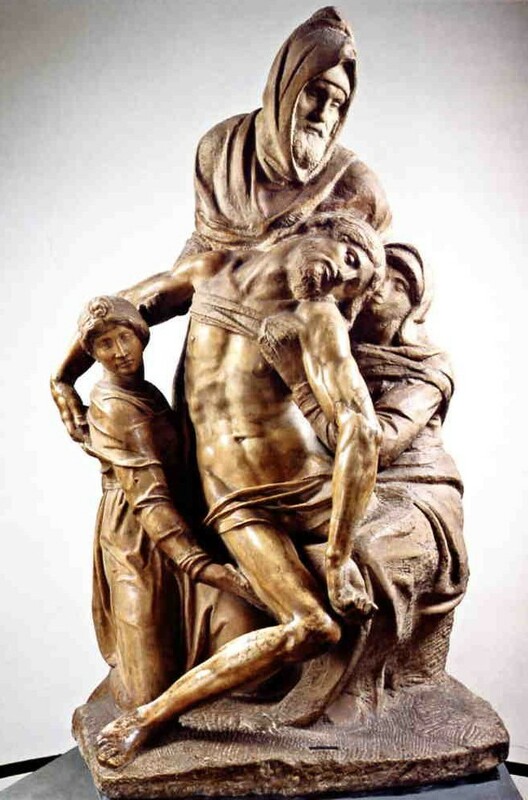 Representing the dead Christ, his mother, seated, a maidservant and the upright figure of a man possibly Nicodemus or Joseph of Arimathea, it remains as a powerful reminder of Michelangelo's visionary prowess. 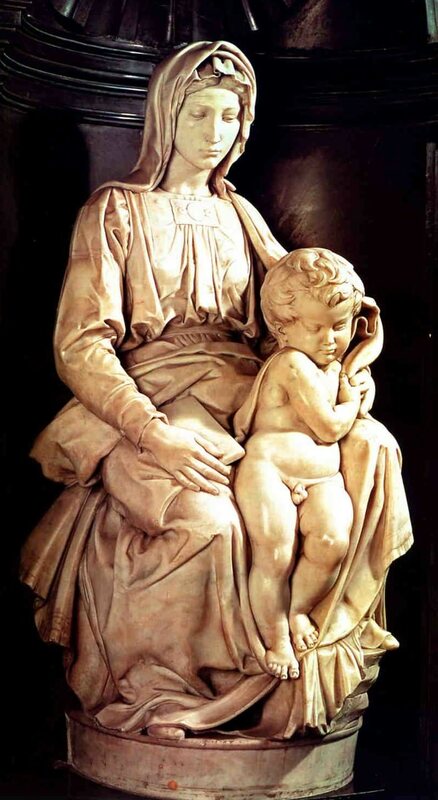 Michelangelo tried to destroy this work because the marble was defective, and the statue remains unfinished.